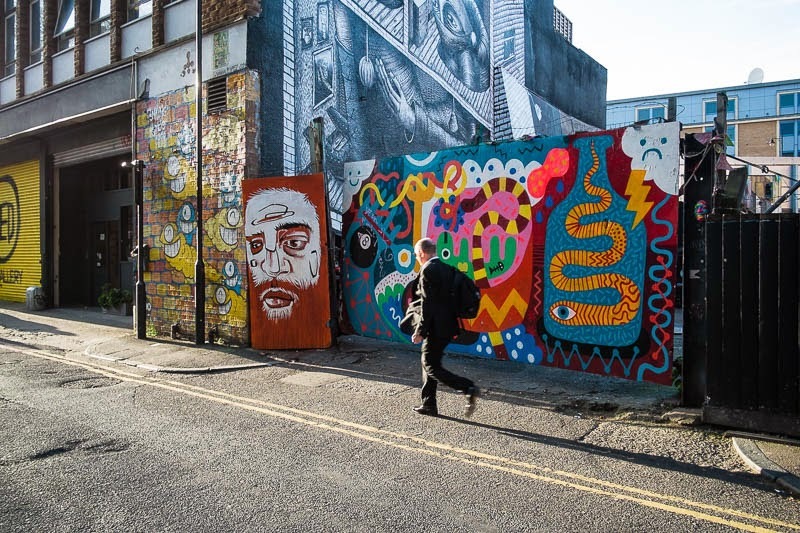 East London is well known for its art scene, not only its galleries and music scene but also the street artists. However trying to break into the scene and get yourself known is as difficult as it has always been. So the other day when I received an email from Eric asking if I would promote his music video "that showcases the art work to a London Garage track" I readily agreed. Take a look and leave him a comment. All new artists need some encouragement. What a great video! It really shows off a lot of great street art. Dynamic street art, and thanks for the link! That's an amazing collection of murals. Yes great artwork to be found in the East, nice shot..
Great video, art and music. I love street art, so clever. The man in a suit makes this photo. Looking forwards to came to London again ! On top of that, have to stand to markets to sell my necklaces. No sell, no money to travel !! !